We're they able to hand out legacy awards ? Can't wait to see pics and hopefully a video of it . Michael seems to have finally learned to control his trigger finger! More pics of the panel, with lots of laughs by the looks of it. 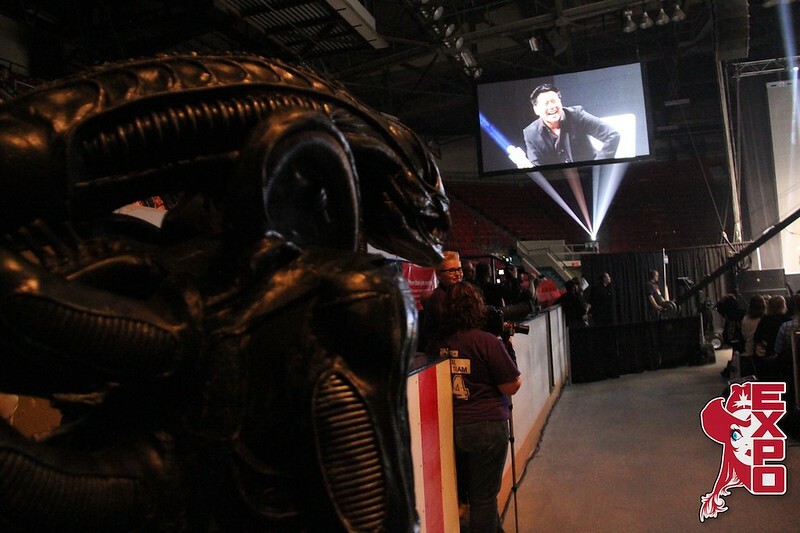 Someone in an Aliens xeno suit was there! Wow must have been awesome ! Yeah. And she's lost a ton of weight, too. Nope, he had it on the trigger of my Pulse rifle when he posed with it after signing it. Was nice to finally meet some of you who attended! "When you can balance a tack hammer on your head, you can head off your foes with a balanced attack"
Its hard to organize my thoughts at the moment. Not a lot of sleep this weekend, but man a lot of memories!!! Im waiting at the airport bar for the first of what will be 3 flights eventually getting me home. Gonna be a long night so I'll l have much more to add later but I gotta say the forum members in attendance absolutely killed it! Such an amazing weekend so thank you guys. looks like a great time was had! extremely jealous! I wonder if Carrie Henn could still do the "Newt Scream..?" "Doing everything the old-fashioned hard way is the BEST way"
Hopefully, thought there would be a ton of pictures from this on here by now. I think folks are just catching their breath. This must have been quite a whirlwind! Rumor was she definitely could! A couple of them were dragging and pretty late Sunday. Word on the street was after the Exposed event they were all taken on a bus to a private party where things got pretty wild. Carrie mentioned while signing autographs that she was a bit hoarse because Reiser challenged her to show if she still 'had it' at some point in the night. Exactly! Man my second flight got delayed causing me to miss my 3rd flight. Then I called up a pal in DC and just had him give me a lift and drive me home rather than wait for the rescheduled flight. Turns out my kid is sick, so that same pal stuck around to babysit so we didn't have to call off work! The chaos continues long after the craziness is over! In any case, I don't have toooo many pictures. Andrew (ADC) obviously has the best haul, but I know him and Darren were going to New York afterwards. He did mention they probably wouldn't be able to get many pictures sorted out until they got back home next week. I myself had some timing issues resulting in a dead phone most of Saturday. I am pretty sparse on my own pics. Me and the infamous Abe! (prior to the Exposed event). I did get Jeanette though! Very cool woman. Everyone was very cool and friendly. Much of the time they were just hanging out themselves and very approachable. I gotta say Ricco was hands down the coolest guy in the room though. Lance and Jeanette were very cool as well. I wish I had come up with more worthwhile things to say because I KNOW they would have happily spent more time chatting. But I often drew a blank and had to roll on out to avoid being a creepy guy staring in awkward silence! This was the forum crew at the end of the day Sunday back at Andrew's hotel. Andrew, Garreth, Moosh, Moosh's mom, Darren, and myself. Tyler and Marla were hanging out and a lot of fun, but had already headed home by the time this pic was taken. This was kind of late in the evening. Such a great time and so happy to meet everyone. Just waiting for the dust to settle then I should be able to provide a full after action report! Lots to say!! What I can say now is it was a blast meeting everyone! After that group photo at Andrew, Darren and Gareth's hotel, we said our "See ya"'s in hopes that someday our paths would cross again! Mom and I honestly can't thank you all enough for the memorable weekend! Bigbisont: fraternising with the enemy while in your Service C's?? You should be court martialed! Great photos, you guys look great and the event looks like it was a blast! Kool Pics!! Aw man, that would have been so kool and hilarious (at the same time) if Carrie did the scream. She should do that for the fans when she goes to an event. Funny, that! Abe mentioned to me that he was there. It was an exhausting weekend, but it was great - meeting up with old friends and new. Stoked to meet Moosh and her mom, bigbisont and Xeno_Stomper. The event was pretty good - very large and a great venue. Unfortunately, the size of the venue meant I spent most of my time rushing and running around! There were three other Xenos there, including a father and son. I saw panels with Jenette Goldstein and Mark Rolston, Bill Paxton, the whole-cast panel on the Saturday night, and Sigourney Weaver. All the panels were really nicely done and very interesting. I had a couple of brief meetings with Weaver - she was really friendly and seemed really genuine. She sent her agent to find me to make sure she could get a photo with me on her phone! Love the pics Gareth and bigbisont. I didn't see the collar either, so wasn't clued in very much. Gonna use that cast pic as my work PC desktop wallpaper. Great pics! I saw Lance even shared them on his facebook page. I will be posting pictures later today Thanks again Terran for the cast photo! I wish they would have had us in your place and you in front though! It was a blast! A definite whirlwind, and Gareth, you are bang on about Sigourney, so awesome! We saw her 3-4 times on Sunday as well, I felt so at ease chatting with her, and she really hung on to everything we chatted about! Very cool! And it really seemed like she was enjoying every minute of interacting with everyone too! Such a great lady!